I seem to only be able to write on Fridays. Oh well. I'll have to work on that. Linking up again with Tara & Vicki. Tomorrow I'm going to a Columbus Crew game followed by a Flogging Molly concert and then drinks and probably dancing. A very busy night!! I did my nails to go with the grey leopard tank top I'll be wearing. 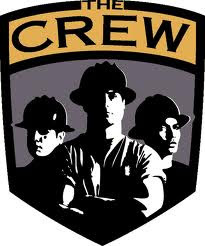 I haven't been to a Crew game in like 5 years, very super excited!! My husband introduced me to this band. We've been trying to see them together for 4 years. He saw them in Toronto last fall but someone had to watch the kids... So I'm really excited for this concert. The awesome part, it's a free concert after the Crew game!! We are traveling back to Columbus this weekend for the game. We have a lot of travel ahead of us this summer. With the game, 3 weddings and Pride! It's going to be a great summer! The other great thing about this summer... I'm not pregnant and I'm finally starting to lose the baby weight!! 11 lbs down. Woohoo!! Wow, love your nails! Have a great weekend! ahhh i LOVE the accent nail! !